Dow, S&P 500 and Nasdaq all hit new lows for 2018 after the Fed hiked interest rates. The Dow gave up a 381 point gain and closed 351 points lower. The major indexes rolled over after Fed Chair Powell said the central bank would continue to shrink its balance sheet, tightening financial conditions. U.S. stocks sank Wednesday in a wild session after the Federal Reserve raised its benchmark overnight lending rate for the fourth time this year. 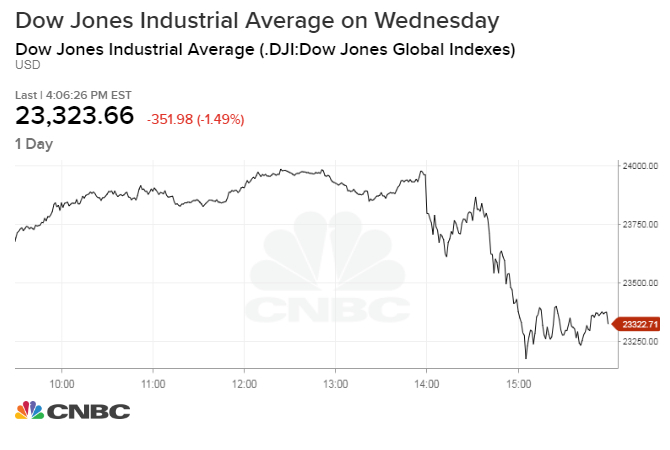 The Dow Jones Industrial Average fell 351.98 points and closed at its lowest level so far this year at 23,323.66, erasing a 380 point gain that came prior to the Fed decision. The broad S&P 500 index also closed at a 2018 low, falling 1.5 percent to finish at 2,506.96 as technology and banks stocks rolled over. The Nasdaq Composite fell 2.1 percent to 6,636.83, its own 2018 closing low with shares of Apple losing more than 3 percent. The major indexes all hit intraday lows for the year as well. For traders, the Fed's statement and Chairman Jerome Powell's subsequent press conference did not suggest that the central bank would slow its pace of rate hikes as quickly as some had hoped. Markets took a leg lower during Powell's comments that the central bank would continue to reduce the size of its balance sheet at the current pace. 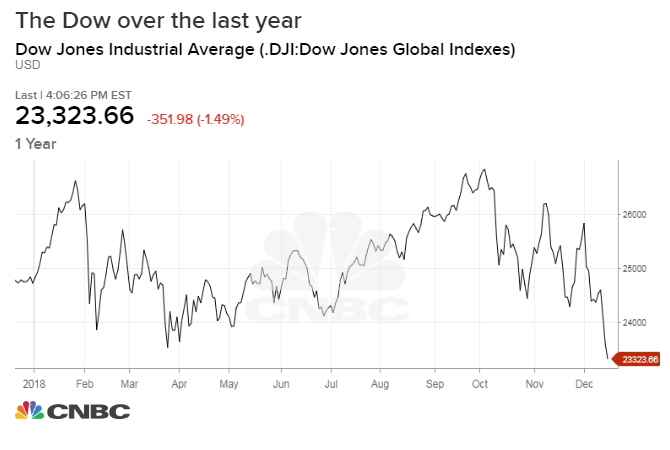 The Dow and S&P 500, which are both in corrections, are on track for their worst December performance since the Great Depression in 1931, down more than 8 percent and 9 percent, respectively, this month. The S&P 500 is now in the red for 2018 by 6.3 percent. The Fed decided to hike its benchmark overnight lending rate by one quarter point on Wednesday to a target range between 2.25 to 2.5 percent. The Fed did however trim its 2019 outlook for rate hikes to just two increases from three previously. "I think the market reaction to all of this is the Fed is going to overdo it," said James Paulsen, chief market strategist at Leuthold Group. "Powell said he sees no problem with balance sheet run off. That's the one that hurts, that's another potential path of dovishness that he didn't take." The central bank permits $50 billion a month to run off the balance sheet, a collection of bonds the central bank bought to stimulate the economy during and after the financial crisis. "I think that the run-off of the balance sheet has been smooth and has served its purpose," he said during a news conference. "I don't see us changing that." Equities across a range of sectors plunged following the Fed's announcement. Consumer companies including Target, Amazon, Newell Brands and Nordstrom all fell more than 3 percent. Banks including Citigroup and Wells Fargo each lost more than 1.5 percent. Aircraft manufacturer Boeing, which had led the Dow higher earlier in the session, dropped 2.5 percent. Industrial conglomerate 3M shed 2.3 percent while United States Steel Corp lost 6 percent. The benchmark 10-year Treasury note yield hit a fresh low of 2.798 percent, its lowest level since May 30. The 30-year Treasury bond broke below 3 percent. The bond market seemed to believe the Fed has already slowed the economy by too much. "The Fed still sees a solid underpinning for the economy based on the numbers and still sees the viability of two rate hikes next year," said Quincy Krosby, chief market strategist at Prudential Financial. "The market needs, for the Fed's statement to prove correct, an unequivocally strong parade of strong economic data for that forecast to hold." "That's been the tug of war in the market," Krosby added. "The old adage is that the price action — that is the market — gets it before the data. That's at the core of the debate." Complicating matters further for the central bank, President Donald Trump warned Tuesday that it must tread carefully in order not to "make yet another mistake." Asked about Trump's criticism, Powell said Wednesday that "political considerations play no role whatsoever in our discussions or decisions about monetary policy. We're always going to be focused on the mission that Congress has given us." FedEx shares were slammed by more than 12 percent after CEO Richard Smith blamed "bad political choices" for weakness in its overseas business. FedEx lowered its 2019 earnings guidance and reported weakness in its international business, putting the stock on pace for its worst day on Wall Street in more than a decade. "I'll just conclude by saying most of the issues that we're dealing with today are induced by bad political choices," FedEx Chairman and CEO Frederick Smith said in a conference call Tuesday. "I mean, making a bad decision about a new tax, creating a tremendously difficult situation with Brexit, the immigration crisis in Germany, the mercantilism and state-owned enterprise initiatives in China, the tariffs that the United States put in unilaterally. So you just go down the list, and they're all things that have created macroeconomic slowdowns." Social media gaint Facebook also fell sharply on Wednesday. Its stock fell more than 7 percent Wednesday after admitting it allowed other big tech companies to read users' private messages. The company's blog post came after a New York Times investigation found that Facebook gave companies including Netflix, Spotify and the Royal Bank of Canada the ability to read, write and delete users' private messages. Further, the D.C. Attorney General said it would sue the company over the Cambridge Analytica scandal. —CNBC's Sam Meredith and Jeff Cox and Patti Domm contributed reporting.